Based in Philly, Japanese Breakfast has played more than a few gigs 140 miles to the south in D.C., opening for a handful of bands before finally getting a headlining gig at the Black Cat last year. Headlining at the fabled 930 Club, though, was something Michelle Zauner almost refused to dream for herself. That she not only headlined there May 30 to open the band’s current U.S. tour, but sold it out (also selling out the first five shows on tour), meant Japanese Breakfast is becoming a main course. “I didn’t think this was really going to happen,” Zauner marveled. Still touring off of last summer’s Soft Sounds from Another Planet, Zauner has crafted an effective set from a recent European tour that swings from here electronically-tinged dream pop to rock and back again. Super-energetic and jumping around the three piece backing band that included her husband Peter Bradley on guitar, Zauner was full of exuberance even if a lot of her songs reflected a tough time in her life, following deaths in her family of her mother and aunt in quick succession. Zauner often hides any mournfulness deep within the lyrics while music on the surface keeps being upbeat on songs that subtly shifted from dream pop to a rockier edge to porto-dance beat (she called for the lighting of the club’s disco ball at one point). Darting around stage manically, she fulfilled the embodiment of rock star, but since Japanese Breakfast is the name of a solo project she had when she was still in Little Big League, it’s not technically a cohesive band — thought the unintroduced trio behind her did much to shape the swirl of sound. 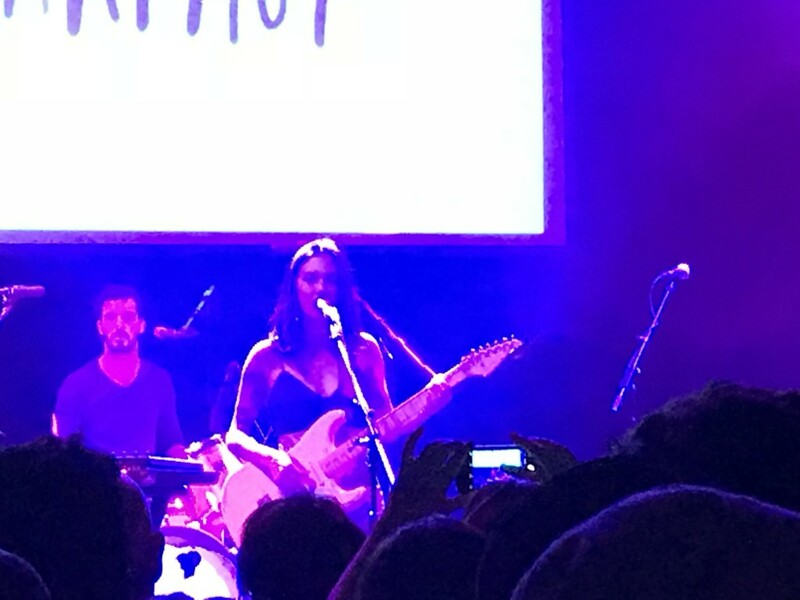 The evening was a triumph for her and the fans, though, especially since the headlining gig at the Black Cat last fall was beset with so many sound problems (she apologized for it, all these months later). Among her variety of approaches was “Machinist,” which begins with amusing robot sounds and on which she is able to echo a vocoder’s disembodied voice. Other times she’s smooth but clear over the entwining guitar sounds. Sometimes with a guitar, often without, she traverses the divided roads to dance music or to the more straight ahead rock she did in her previous band, one song of which she performed. The single encore, “Dreams,” almost seemed too well suited for her, not only because it was a salute to Dolores Reardon, who died unexpectedly early this year, but because her timbre, and the intent in the song, was so closely matched to hers. It was the perfect capper for a set that ended with the all-embracing “Everybody Wants to Love You,” which seemed marred a bit by the addition of Sam Cook-Parrott of Radiator Hospital, one of the two opening bands. He had been on the original recording, Zauner said, but he seemed mixed too loud — a minor casualty of the patriarchy. His was the better of the two opening bands, though. Radiator Hospital was loose and driving and able to share vocal with guitarist Cynthia Schemmer on a couple of songs as the mood dictated. New York’s LVL UP, by contrast, was almost too calculated in sharing songs and lead singing duties between the front line of guitarists Mike Caridi and Dave Benton with bassist Nick Corbo. One by one, they traded off tunes in order among them – a band as a WeWork space.